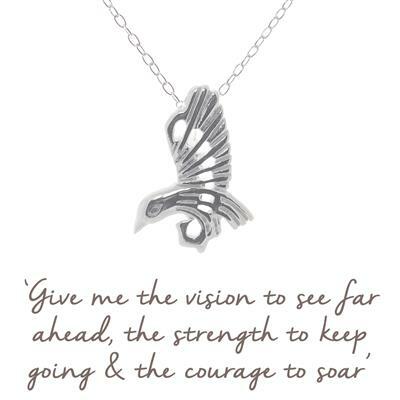 Choose our Eagle Necklace if you are setting out on a new challenge, or embarking on a new project. The mantra encourages perseverance and commitment, as well as strength and courage on the journey. It calls on you to set yourself lofty and worthwhile goals, inspired by how high an eagle flies. It is also a great mantra to live your life by: with vision, determination, courage and purpose. Perfect as a gift for someone embarking on a new challenge | or a gift to encourage self-belief and confidence. We chose an eagle to represent this mantra because it flies higher than any other bird; and its keen eyes represent perspicacity and far-sightedness. From Ancient Rome to Native American traditions, the Eagle has represented power and strength, courage and wisdom, revered as a sacred being and messenger of the gods. Hold onto your necklace from time to time throughout the day, and repeat its mantra to yourself. Sometimes, taking a mindful pause and a deep breath is enough to refocus our thinking, and help us muster our enthusiasm. Use the mantra to remind yourself of the qualities you need to draw upon, from deep within you.